Are you wondering how to incorporate physical fitness into your preschooler’s day? Try these great alphabet exercises with your child and they will learn while they are moving their bodies. We love to make learning and moving fun here at Kids Activities Blog. It is important for all kids to move in order to stay healthy and fit. I am also trying to make things fun  for Rory, and of course incorporate learning in them. We have an ABC puzzle on our floor that we used for this activity, but you can use anything. You could just write the ABC's on paper and put them all over the floor. For this activity, we put the ABC's all over our floor. We mixed them up, so that Rory would have to walk more from A to B. We started with A, and then continued with the letters until we got to Z. Each letter has a movement  that we would act out when we got to that letter. You can do any movement you would like, but here is a list of our actions. We just went from letter to letter and had fun with it! This is a good idea for an end of the year activity in preschool. We did an ABC list of foods during nutrition week. 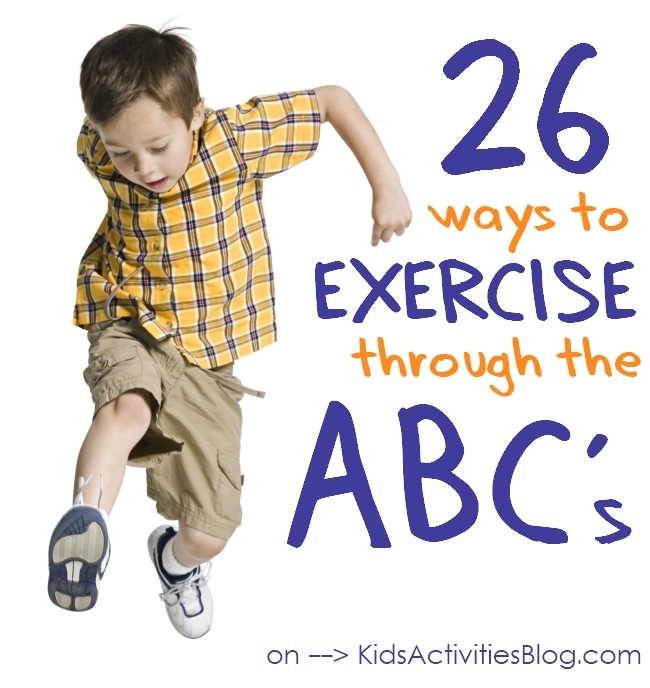 I like this exercise ABC activity list as well. Thank you. LOVE this! Just made a big poster for my kiddos and the kiddos I watch after school. They’re going to love doing these exercises. Thanks for the inspiration. I changed a few, but plan to post it to my blog if that’s okay with you. I’ll definitely add a link to this so others can come here and see all the great things you do! Thanks again. I simply was blown away reading this. I definitely will practice this. I really would like to receive more from you. Thank you. I LOVE your 26 alphabet exercises. I created something similar… activity cards that combine movement with learning the alphabet. They are perfect for kiddos 3-7 yo of all abilities. Please check them out and let me know what you think. THANKS!!! I incorporated most of this. I changed a few, as I wanted to associate the letters to phonics.